It’s a mask…just like Charlton Ogburn said! 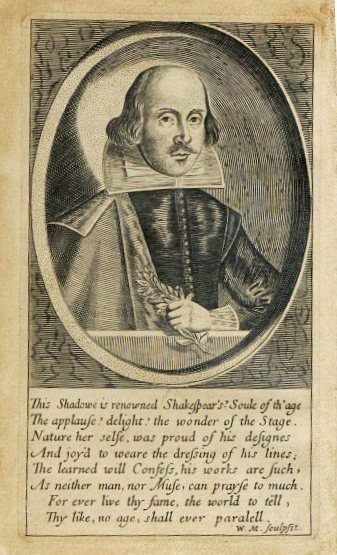 Taking out the exclamation point and reading the first line literally, it implies that Shakespeare had a shadow who was the soul of the age. Even keeping the ! suggests that this shadow is Shakespeare’s shadow. I know how the traditionalists read it but in any case it’s as awkward as the mask like picture. Sorry, what I took for exclamation points are actually question marks — even more suspicious! There are eight missing sonnets and offhand I can’t recall which ones they are. Of course it’s argued that the question marks and exclamation points were then interchangeable, but I really don’t buy it. To me this is a Jonson production, arranged by him before his death in 1637, and an extension of the folio attempt to turn Shakespeare into a commoner and an actor of Stratford. 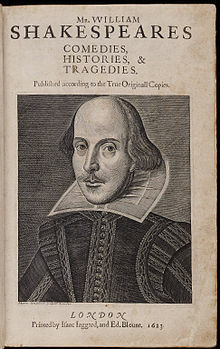 One of the poems, not by Shakespeare, is an homage to the great author and in the title marks his death as Anno 1616, thereby putting forth the FIRST SPECIFIC link to Stratford (as opposite to Sweet Swan of Avon and Stratford monument of 1623). You will see a drop-down with all the titles on it — fictitious titles. Clearly an attempt to deal with the real 1609 edition of sonnets, which were then underground and would continue so until 1711.